Went to the Medical offices again for my first two week check-up. Here are my stats: I am now 10lbs 3oz, 22 inches long, and my head measures (around) at 39cm. I am at the top of the charts the doctors say. I also had an explosive episode that got all over my car seat. Mom's going to have to do some laundry tomorrow! Daddy cleaned it up the best he could, but its better if my mommy washes it all clean tomorrow. They also told mommy and daddy that I need a Multivitamin supplement that I need to have to grow big and strong (Tasted it just a few minutes ago and spit all of it up.. Mommy needs to try again tomorrow with the vitamins). After that (two hours long!) we all went to Daddy's work where it was HOT! Not just the out side but the inside as well! Every one that was there thought I was cute and a bundle of joy. I started to cry because it was hot and I didn't want to be there! The chocolate cigars were all but mush but it was a good thought and I heard it made Daddy happy and it looked like they were all but gone! Tomorrow, Mommy is all by herself without Grandma or Daddy, so wish her luck! Two weeks 2 days old; Sleeping eating and just tired! From day 11 to now I have been spending my days with the family. On Thursday, Grandpa J spent some time with me and mom. He came down to visit me and mom. He gave us some pretty flowers called Carnations. Daddy didn't go to work that day either but he went to lunch with Grandma. We took a walk to the mall and went to BJ's. Mom and her dad had lunch while I sat and was quiet till the end. After that we went home and it was my turn to eat. After a quick nap for all of us. My dad came and surprised us with a new chairs and table for the back yard. There were only two chairs but mom got the camera out and took pictures of Grandma and Grandpa J with me. Then mom and I got a few pictures taken as well. This time mom didn't look too doped up. Yesterday, I met my second grandpa. He was interesting. He didn't want to hold me but was very nice and complemented me on my eyes when I did open them. Then after grandma dropped 2nd Grandpa off at his car, we all went to Tanforan and met up with Auntie, Uncle and Cousin. We ate again at BJ's and they spent some time talking while I again slept. When we came home we bid farewell to Grandma, I guess she doesn't live as close as I thought she did. Some place up in Washington State. I am going to miss her! She had a calming effect for mom and I. Today was chill day for daddy, mommy and I. We really didn't do much besides stay in bed for most of the morning and mommy got breakfast in bed. Then with me went back to sleep. After noon daddy went and got something called Pho-Retto which is code for Burrieto and Pho Soup. I was a bit fussy since I didn't get anything but I was happy to see daddy again and some time soon I hope I can enjoy what they get to eat! I am getting a little fussy so I better go! Tomorrow I go to the doctors and go to my daddy's work. I all ready went to mommy's work so I get to see some different people. More tomorrow! I felt really good that today I got to spend it alone with my mommy. We got to nap in the morning and hang out. Mommy actually got to use the baby monitor that she got for a baby shower present from Uncle A. I tested it out with a few screams and even with mommy in the next room it was amazing! I did poo twice (with out daddy being here) and actually had to take a bath again (yuck) because mommy didn't put the dipper on tight enough and got all over the both of us! Mommy actually fed me a bottle of formula because I ate most of mommy's milk because I am growing. Daddy came home just in time for mommy to take a shower and she got something to eat. I am going to sign off because I need my rest if I am going to have another full day tomorrow! Today I am 10 days old and it was the first day daddy went back to work for the first time in over a week and a half! Mommy and I got to spend the morning together. Grandma came and took mommy and me to a restaurant called Bakers Square and then went up to San Francisco to the hospital again. This time it was for my mommy and not for me (Yea!). I had to be changed so we went up to the 6th floor of the medical building and got to be changed and feed there. A lady told us that the room for nursing moms just opened two weeks ago. very covenant for mom and I. so we went up there and mommy thought we had a bit more time than we did because we ended up running to the other medical building for mom's appointment. Grandma had her exercise along with mommy. Mommy was called in right away to the doctors and she was given a clean bill of health! After that mommy had to pick up some medication that was due to the hospital stays she went through and then we went back to the other medical building for mommy to sign a paper for something and then me, mommy and Grandma went back to her hotel room and Grandma got to "surf the net" as mommy put it. After that my daddy appeared and we ate at the Red Lobster.Well I didn't eat there but every one else did and I was a sleep. It's a very busy day for some one like me being so young. 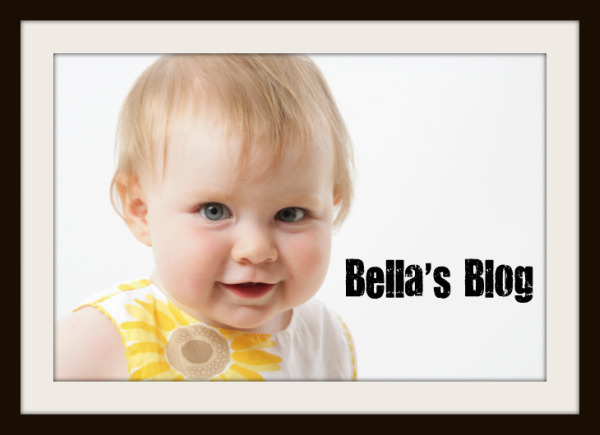 This is the first entry of the Bella Blog! It happens to be Father's day as well! I am 9 days old and my mom and dad love me very much! I was born on June 12, 2009 at 3:52 in the morning by emergency C-Section due to the fact I was a bit too big for my mom to have me naturally. When I came out I was 9 pounds 13 oz and 20 inches long! The first 3 days of life my mom, dad and I, stayed at the hospital were there was a lot of bonding with friends and family. I got my very first bath and got used to the out side world (its a wild place and noisy!). I was released with mommy on Monday the 15th and was taken by grandma to my home. I met my big brother and big sister (both what daddy calls cats), and got to see where I will be living. The 4th day (June 16th) I had to go to the hospital for a blood test for a condition called Jaundice. It's normal in babies but the prick on my heal hurt! They also did the test in the hospital, but it doesn't stop it from hurting! When it was done mom had to feed me and we went to a different room in the medical center and a nice lady took us to the back and let mommy feed me, also looked at my weight and color. Mommy and Daddy didn't know it but we were there to see her a little later, we unfortunately made every one late for the rest of the day! I saw another baby that was born on the same day as I, his nickname was "The Boss" though I didn't get a very good look at him. We were told that I needed more blood work since my levels went up to 18. So we needed to come back in two days to get more blood work done so that the doctors can see if I needed to go back to the hospital. The 5th day (June 17th) we spent relaxing with grandma and I got my second bath. Mommy and daddy are both exhausted from looking after me but I can not look after myself at the moment! The 6th day of my life (June 18th) was half spent in San Francisco to get my blood drawn again. Mommy told the nurse to put a lot of pressure on the cut because I bleed all over the place! Then we went to the lobby of the Lactation center so that I could get fed by mommy as I was crying because the wound in my foot hurt! Good news is that I don't have to go back for testing! The Jaundice count is down! The 7th day (June 19th) of my life was scary! The morning and mid afternoon was spent with grandma and mommy and daddy picking out things for Father's day and little bits of foods. Also went to Mommy's work so she could give them paper work to prove I exist. Silly people. They oohed and awed at me, but most of them were at home. We went back to the hotel room and then the scary part happened. Mommy called the advice nurse as she had trouble breathing and wanted to call to see if it was normal as the not breathing part. When she got to the ER, the doctor had to admit her in the Hospital in the afternoon because she couldn't breath all too good. I didn't get to say good bye because of all the sick people. Daddy took me home with his sister and she watched me as daddy went back to comfort mommy. I was fed formula as mommy couldn't give me breast milk as the medication could be harmful to me. The 8th day of life, yesterday June 20th, Mommy was still in the hospital and daddy gave me kisses from her but it wasn't the same as from her. I got to go to Aunt A's Birthday Party with Daddy and Grandma. I got passed around and a joke from one of the people there stated that another baby boy was my prom date. I don't know what prom dates are but they sound yucky! Went with Grandma as daddy went to see mommy again at the hospital. I was spending time with Grandma when who should appear MOMMY! I was very happy to see her again and she was crying as she was holding me because that's what mom's do when they haven't seen their babies. While I was with Grandma my bit of umblical cord that was attached, fell off. Mommy has it now but Gradma threw it away at first. Today, as I stated I am 9 days old and today was Father's day! I spent it with my Grandpa J and my daddy. Mommy bought a Grandpa day card for me since I don't really know this holiday yet. I spent part of the morning in the car and went to a place called Yellow Submarine with Grandpa, daddy and mommy. I was fast asleep during the time they spent at the restaurant. Then we went back to Grandpa's home and I was fed there. Daddy took a small nap and mommy was passing out as we were sitting there enjoying classical music and just a good sense of relief that the family is back together again! Mommy says more pictures are on the way to every one and she will keep writing in this blog till when ever so please stay tuned!